CHC Elysium Boutique Hotel is a contemporary luxurious hotel located in Analipsi of Hersonissos on wonderful Crete island, Greece. The architecture and interior design of the hotel, the atmospheric luxury, the delicious meals and the high-standard services and provisions render it an ideal destination for the holiday that guests always dreamt of. Exquisite 5-star property well-located on a beautiful beach close to the big resort of Hersonissos with plenty to do, includes upgrade to half-board basis at the hotel. Discount upgrades to all-inclusive board are also available. Special offer prices and upgrades available here at Going Luxury, get in touch for a bespoke holiday itinerary. Travel April, May & October dates for the best prices with other dates available at supplements. Prices based on 7-night stays but other durations are also available. Use our live chat service or call our 'luxury holiday experts' for help with your holiday. 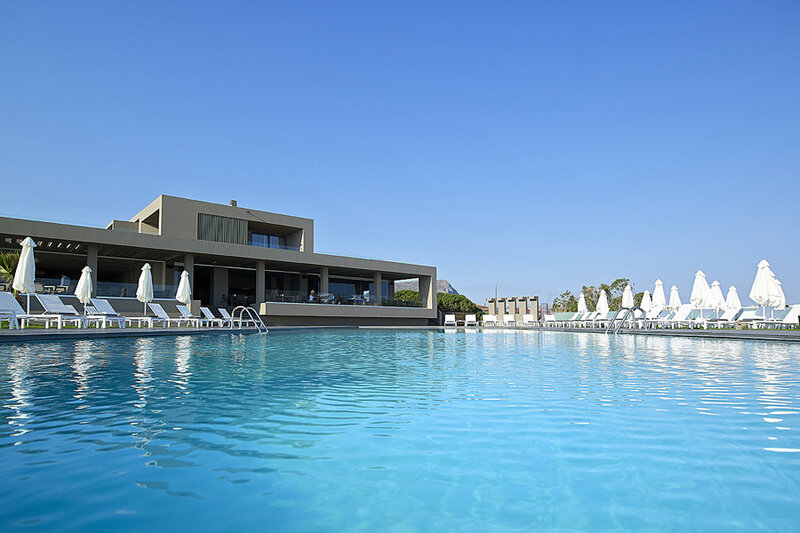 The CHC Elysium Boutique Hotel is a contemporary luxurious hotel located in Analipsi resort of Hersonissos, featuring a magnificent view, a sandy turquoise beach and a quiet environment. The architecture and interior design of the hotel, the atmospheric luxury, the delicious meals and the high-standard services and provisions render it an ideal destination for the holiday you’ve always dreamt of. The area of Analispi is appropriate for all kinds of holiday as it offers a wide selection of options due to its perfect location. The tourist resort lies only 2 kilometres away from the centre of Hersonissos, famous for the lively nightlife, numerous hotels, the popular waterslide beach, bars, swimming pools, sports and extreme sports, bungee jumping, carts and shopping centres close enough to the beach. CHC Hotels offer memorable hospitality experiences through management innovations and customers’ satisfaction focus. CHC Hotels offer quality hotels located in superb beach locations, mostly in Crete – Greece. Our aim is to provide holistic value-for-money hospitality experiences through addressing the most personal needs of our guests. CHC Elysium Boutique Hotel offers a five-star stay at a chic, adults-only resort near the Cretan town of Hersonissos, with a choice of either dinner or all-inclusive board. Modern design at its best, this sleek beachfront CHC Elysium Boutique Hotel has enough decadent amenities and glossy aesthetics to clinch the deal for style-seekers. Set in the wondrously laid-back village of Analipsi, near the heavyweight hub that is Heraklion, it’s somewhat of a find for those wanting after-hours party action – and for those who don’t. Days can be spent sipping cocktails by the come-hither outdoor pool, blissing out with massages and facials in the little spa, lazing on lovely beaches, or enjoying a workout in the fitness room – and all without kids around. Equally impressive are the wining and dining options: there are many themed buffet nights, limitless snacks and light bites throughout the day, and as many locally-branded drinks as you can pack into 24 hours. It’s the on-trend guest rooms that really give this bolthole its cool edge. They’re complete with grey and white tones, gleaming dark wood flooring, gorgeous en-suite bathrooms, beds adorned with designer bedlinen, and a private furnished balcony – with all this, you may just forget to hit the beach. The all-inclusive concept includes all meals; breakfast, lunch and dinner served buffet style in the main restaurant. A Continental breakfast for early risers (with reservation) and late sleepers is also offered. During lunch drinks are self-service, and during dinner are served to the table (includes house wine, bottled water, beer and soft drinks). A choice of snacks are available between 11am and 5.30pm, and coffee time from 3pm to 5pm, both at the snack-bar restaurant. A selection of local spirits, seasonal cocktails, alcoholic drinks, long drinks, water, beers, local wine, Greek coffee, filter coffee, cocoa, tea, soft drinks and fruit juices are available between 10am and 11pm, subject to outlet opening times. Spa services (on extra charge) such as Massage, Sauna, Steam bath, face treatment, manicure – pedicure. A small beach with pebble where sunbeds and umbrellas are offered for free to our valuable guests. Hotel facilities include an outdoor swimming pool with surrounding sun-terrace furnished with loungers and parasols.